Ticket Update! | St.Helens R.F.C. 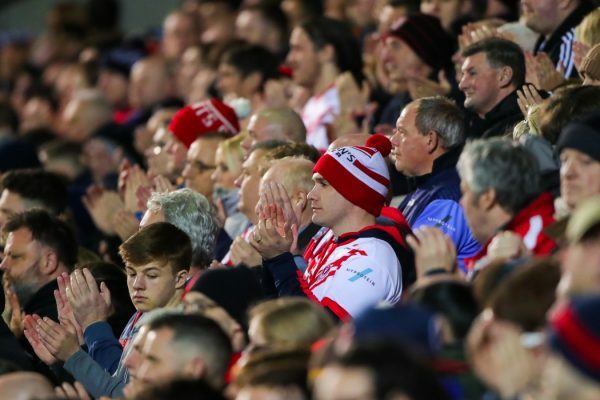 There are very limited tickets remaining for tonight's Betfred Super League Season Opener vs. Wigan Warriors. Please see some below guidance and ticket information before travelling to the match. You can still reserve your tickets online here up until 5pm today while stocks last. There are mostly just single seats remaining in most blocks with some additional tickets still remaining in unallocated Bronze blocks. There will be limited cash turnstiles on the evening on a first-come first served basis in the Totally Wicked North Stand blocks NH and NI – tickets in these blocks will not be available from the Ticket Office. Any remaining tickets from other areas including South block SB, will be available at the Ticket Office while stocks last. We cannot guarantee there will be any tickets remaining before kick-off so we advise fans to secure theirs before gates open at 6pm. Those fans who have purchased their match tickets already and not yet collected them are advised to arrive early to avoid potential queues at the ticket collection point. Please note all PRE-BOUGHT match tickets can be collected from the Ticket Collection point only, which is located next to the ticket office. Please also be advised that the ticket office is only for purchases made on the evening and for collection of any 2019 Membership cards. The game will kick off at 7:45pm with gates open from 6pm.